Attila Nemes, Research Professor at the Norwegian Institute of Bioeconomy Research (NIBIO). He is one of the authors behind the paper on macroporosity, published in Nature, Sept. 5th, 2018. Photo: Anette Tjomsland. Soil has a complex structure that is intertwined by tiny holes and cavities. The larger ones are called macropores, which are vital in the transportation of water. Climate change could however alter macroporosity, leading to more flash floodings and soil erosion. Macropores are greater than 0.009 mm and usually represent a very small fraction of the earth’s soil volume. However, they are responsible for up to 70% of water infiltration into the soil. All pores in the soil help transport water and nutrients to plants and restore ground water, but macropores are crucial for the ability of soil to absorb water quickly from heavy rainfall and storms. It has been proven that climate change influence macropores via biogeochemical processes, but there has been limited knowledge about the rate and extent of the impact. A newly published article in Nature states that humid and wet climates reduce the occurrence of macropores in the soil, whereas drier and warmer climates promote the expression of macroporosity. “It is important to predict the response of macroporosity to climate change because of its role in the water cycle, and ultimately in water scarcity, food security, human health and loss of biodiversity,” says the study’s lead author, Daniel Hirmas, an associate professor in the Department of Environmental Sciences at UC Riverside in California, in a press release. The authors are recommending that the impact of climate on macroporosity should be added to global climate models. Some macropores are visible to the eye, while others are only visible when magnified in a microscope. They may represent only 1-2 % of the earth’s soil volume; still, they are responsible for up to 70% of water infiltration in the soil. Photo: Attila Nemes. To examine changes in macroporosity across rainfall, temperature, and humidity gradients, the researchers combined soil data from more than 50 years of sample collection from different climatic zones across the US with atmospheric data from a network of weather stations. “We examined these data to see if we could say something about future expectations from current climates. 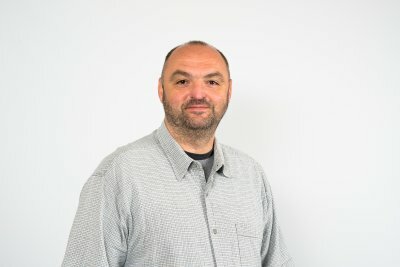 We assumed that standard measurements from the past, and still ongoing collections at present, could model what a shift in climate will be if climate in a region shifts towards what it is like in another region today,” says Attila Nemes, Research Professor in the Norwegian Institute of Bioeconomy Research. He is one of the authors behind the paper. Nemes explains that this required advanced data mining and analysis. The article presents evidence that climate-related changes in macroporosity are likely to occur over shorter timescales than previously thought. In the US, increasing humidity by 2080-2100 will probably reduce soil macroporosity in most regions. A wetter and more humid climate leads to soil with a smaller volume of macropores to guide the water into the ground. The consequences could be slower infiltration of water into the soil, potentially leading to more surface runoff and erosion, and more flash floodings. On the other hand, soil in dry areas are likely to develop more macropores. Does this mean that dry areas will absorb more water? Not necessarily, like many issues in research it is complicated. “It’s not only macropores that guide water into the soil, much smaller pores also do. Additionally, other properties and phenomena, such as water repellence, also influence how fast water will infiltrate the soil, especially in drier areas. These are complex phenomena that need to be seen in coherence,” explains Nemes. 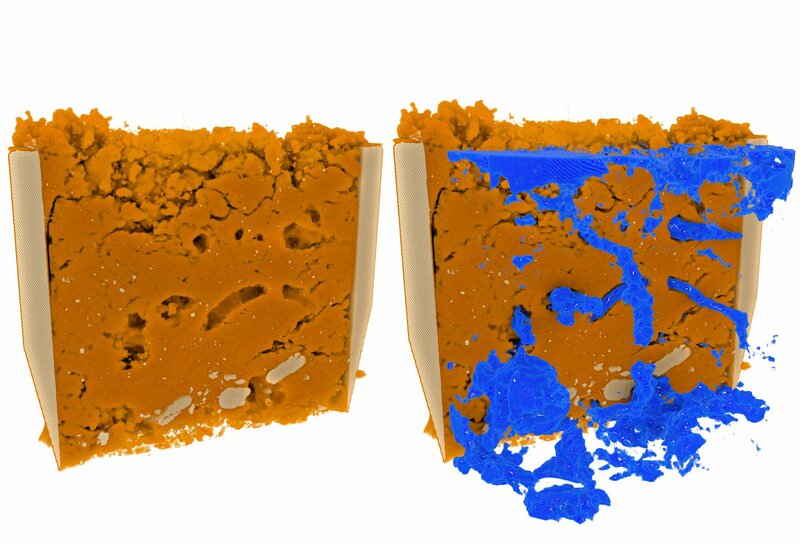 X-Ray tomography, popularly known as CT scanning, is increasingly used to study soil macroporosity. This is a 3D model of the imaged macropore system of a soil sample. To the right, the pathway of water through the connected macropore system is visualized. 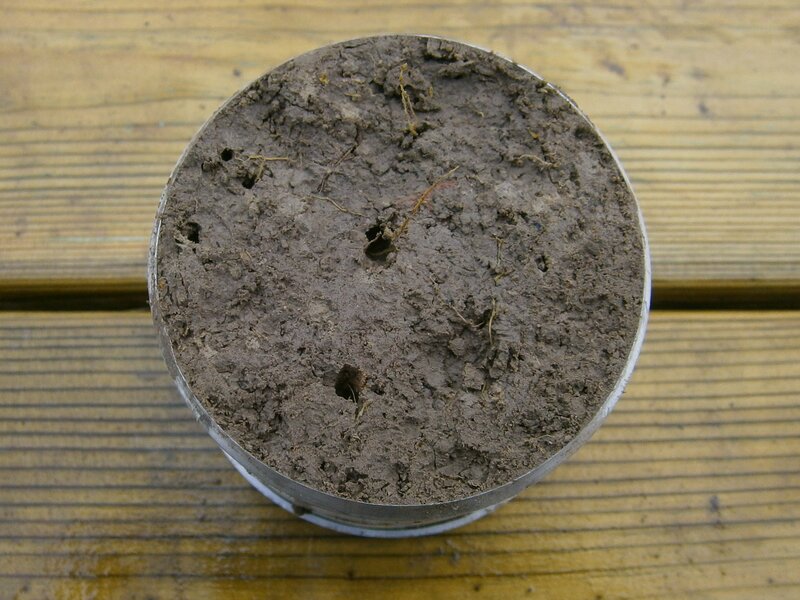 This sample was taken within the international Soilspace project that aims to improve knowledge of how water flows through soil, using the X-Ray tomography technology to characterize the soil’s pore system. Credits: Johannes Koestel, Swedish University of Agricultural Sciences, Uppsala, Sweden. “At this moment we could only secure suitable data from the US that was standardized and covered a long-enough time period and a wide-enough geographical area,” says Nemes. The problem does however need to be studied in a global context, and that will require better convergence of measurement techniques and standards applied in the World. Currently, this is a huge challenge. “It would have been rather difficult to repeat this study using data from outside the US, because of the heterogeneity in techniques and many aspects of data collection,” states Nemes. “In addition to identifying the role that climate has on macroporosity, we hope that our findings might shed light on the need for and spur efforts to standardize global soil data collection and analysis. This would allow similar measurements to be used in assessing macroporosity across the world and in comparing a wider range of soils and climates”, says Hirmas. More advanced technology is becoming available these days to study macropores with the help of advanced X-ray imaging, better known as CT scanning. Nemes explaines that it is basically the same imaging method that is used in human medicine. He is emphasising the need to set international standards to this technique. 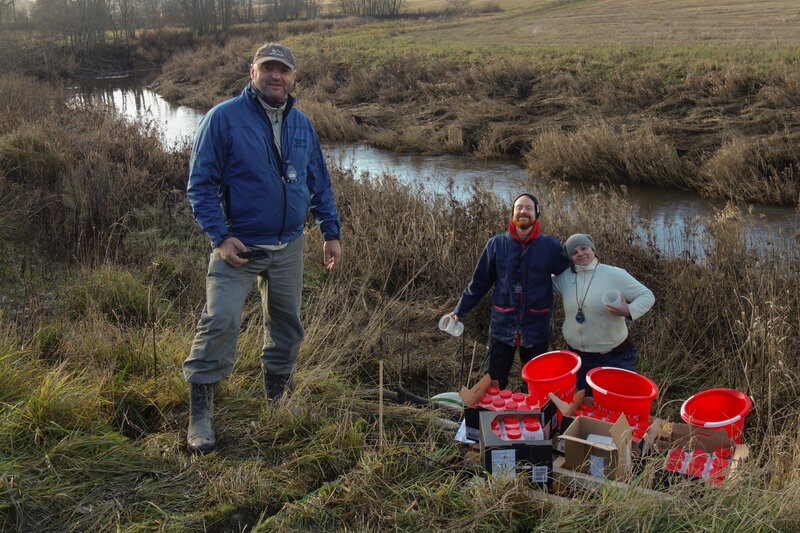 Attila Nemes to the left, in the field together with two NIBIO colleagues, Dominika Krzeminska and Frederik Bøe. The project Bufferklima aims to enhance knowledge about the effect of different vegetation types on reducing run-off and erosion from agricultural land to our waters. The presence of macropores helps reduce surface runoff and soil erosion. Their abundance may be impacted by climate change. In the future, measures to reduce erosion will be even more important. Photo: Anne-Grete Buseth Blankenberg. Three soil scientists, two climate scientists and one spatial statistician worked together on the study and the paper. “It is not very common to work together so well in synergy and detect something like this. Research on soil porosity is typically concerned with a snapshot of the moment or short-term changes locally. However, what will our soil look like in 50 years? In our understanding, this has not been done before, it has been on the agenda, but it has always been simplified, in both soil research and climate research,” says Nemes. Both Nemes and Hirmas believe cross-sectoral research is essential to develop good models for macroporosity, to be better prepared for future changes. “This result should be visible to multiple sciences; soil scientists need to convince scientists in the atmospheric, ecological, and hydrological sciences of the importance of soil as a very complex, dynamic, and interesting medium,” adds Hirmas. “Soil should not be treated as a static medium, in whatever long-term and large-scale simulation you’re dealing with, whether it’s climate models or hydrological models. We need research to be able to incorporate climate effects, advance our current models and support them with suitable data,” says Nemes. More flooding may be one of the consequences of smaller macroporosity in the soil. 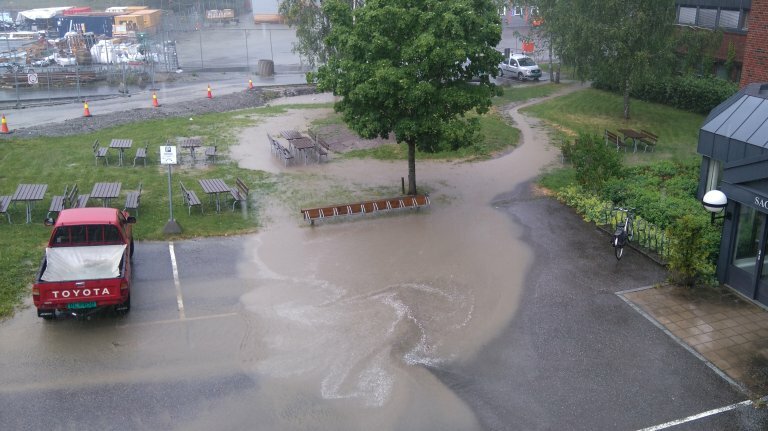 This picture documents rapid “flash” flooding outside NIBIO in Ås, Norway, June 17th 2018. Photo: Attila Nemes. How about macropores in Norwegian soil? 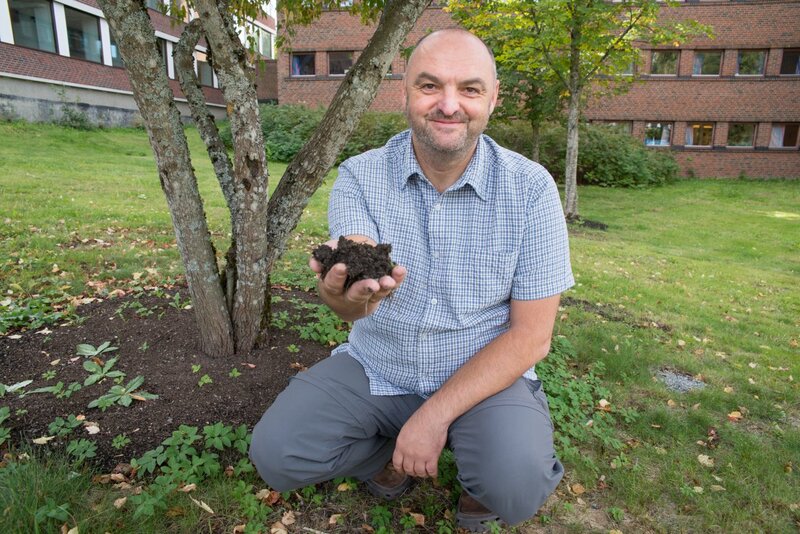 "As of today, we would not be able to map soil macroporosity the same way in Norway because the range of climate zones in Norway is narrower, and we also lack suitable soil information. It is relevant for us to be strongly involved with the international scientific community in any effort to update our data and models to include linkages between climate and soil macroporosity. In this respect, we are able to capitalize on a wide range of past and ongoing research at NIBIO that has focussed on soil in general and the soil pore-system in particular", says Nemes.